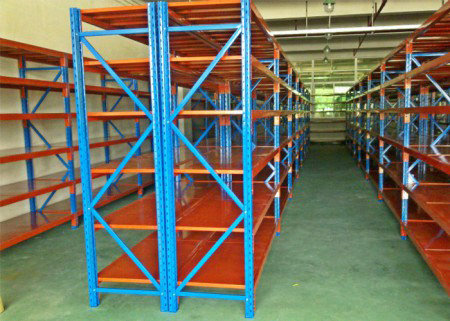 Long span shelving which has special design, proper structure, and is easy for install in dismantling without any screw thread connector for 200-600kg per layer, it is widely used in supermarket, store, and other enterprises. this prouduct is the level of international standard the height could be adjusted easily by 50 distance. Long span shelving can be decked with particle board,wire decking,Zinc steel panel,rolling metal decking to make them iedal for many different environments. Longspan is a long,durable,versatile and economical shelving systems. It has fully adjustable shelf heights and lengths. And because it uses a modular design and bolt-free lock-in systems requiring no special tools, it is installed in minutes. It looks good and minimises lost space from uprights making it ideal for a wide variety of applications from archives to automotive,factories,warehouses,retail,wholesale and commercial. 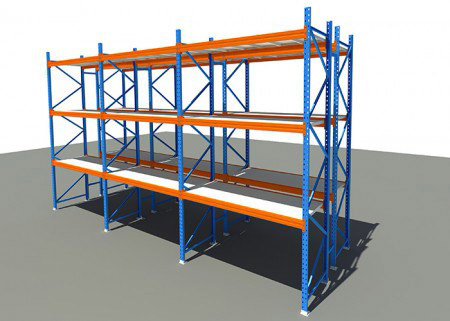 Long span shelving is composed of the following three parts: frame, beam and shelf. The beam can be adjusted up and down in units of 50mm. The height of the frames and the height of each layer must be a multiple of 50. The height of the floor is the height from the upper surface of the beam to the ground. The frame diagonal bracing is 500mm. The shelves of the shelf are composed of columns, cross braces, diagonal braces, plastic feet, iron bases and bolts. Usually, the frame specification is 55*47*1.5mm and beams use P-beams (stepped beams). Specifications of beams are P50*30*1.5, P60*40*1.5, P80*50*1.5. There are three kinds of shelf: steel panel rolled panel and wood panel. When laying the wood layer, pay attention to the additional support to prevent the wood laminate from breaking. 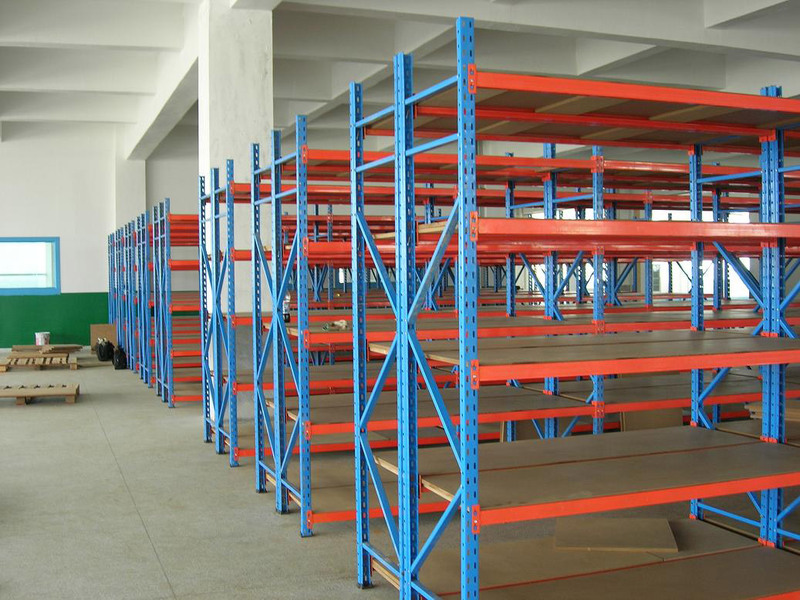 The depth of long span shelving is not more than 1200mm and the length does not exceed 2500mm, otherwise, the P-beam will be unstable or outward. 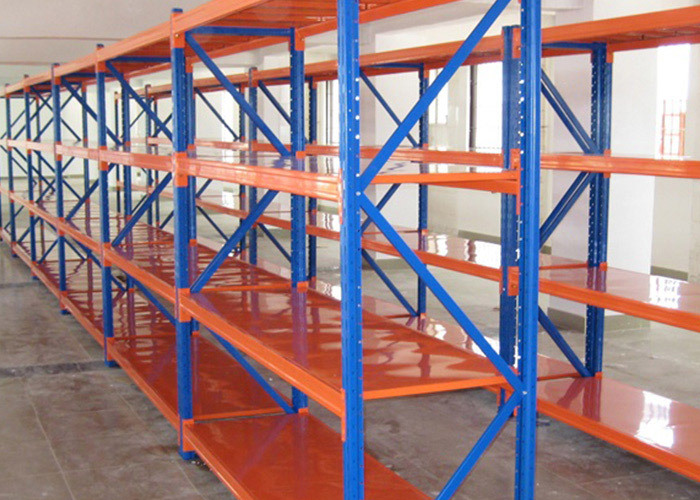 Usually, the loading capacity of each shelf is 500kg. 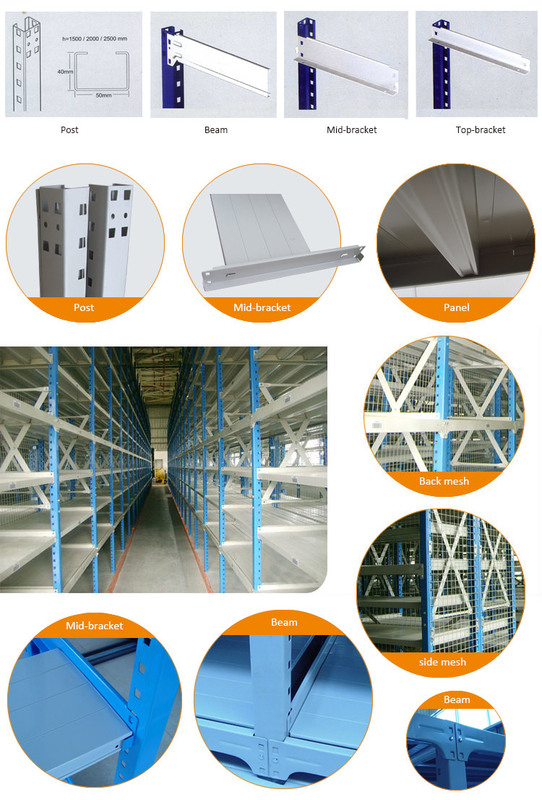 According to customer requirements, Long span shelving can be added with side sealing nets (soft borders), back sealing nets (hard borders), partition boards, etc. Long span shelving can be extended to the mezzanine floor. It is used for manual loading and picking storage . Without forklift to save cost . Beams are installed directly into the holes of uprights . It is easy installation and adjustable . Flexible accessories for different usage. Selective dividers for different storage requirement. All kinds of sizes and colors are available.